GONDOLA RIDES CAN ONLY BE BOOKED ONLINE. PHONE RESERVATIONS ARE NOT ACCEPTED. 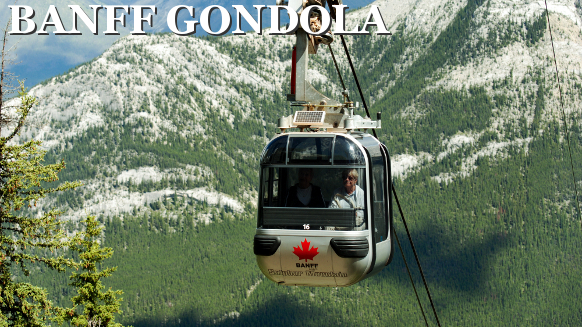 BANFF, ALBERTA, Canada – Welcome to the official site for the famous Banff Gondola. One of the most fun things to do in the Canadian Rockies, the Banff Gondola allows you to ride all the way to the top of Sulphur Mountain in Banff, Alberta and experience Canada from a bird’s eye view! From the top of Sulphur Mountain, you and your family or friends can catch a great view of six different mountain ranges. And as a year-round activity, this is the perfect choice for your vacation in the Canadian Rockies. Riding the Banff Gondola takes about seven minutes and travels 2300 miles above the parking lot in Banff, Canada. Once you reach the summit, you can tour the sightseeing shop and even eat in an authentic Rocky Mountain restaurant! The adventure begins with an eight minute journey to the summit of Sulphur Mountain in a modern, fully-enclosed four passenger gondola cabin. The views become increasingly spectacular as you climb 698m (2,292 ft) to an elevation of 2,281m (7,486 ft) at the Summit Upper Terminal – the departure point for a mountaintop of activities. If you’re looking for more things to do in Banff, Canada, there is a hike along a boardwalk at the summit of Sulfur Mountain. From here you can gain an even better view of the Canadian Rockies, catching sight of Cascade Mountain, Mount Brewster, Mount Aylmer, and Tunnel Mountain. You can also check out the hot waters at Upper Hot Springs, right next to the Banff Gondola if you need some rest and relaxation! Whether you’re looking for a getaway for the whole family or a great place to travel solo, you should check out the Banff Gondola. We promise it will be worth it! Watch this out this cool video from Brewster Travel! The gondola might not be for those with a great fear of heights. The cable cars have a glass panel in the bottom. They gain elevation quickly and can rock when the wind is blowing. Even in the summer months it can be cold and windy at the summit, so dress appropriately. And allow for at least a half hour or more to walk around the trails and board walks at the top.